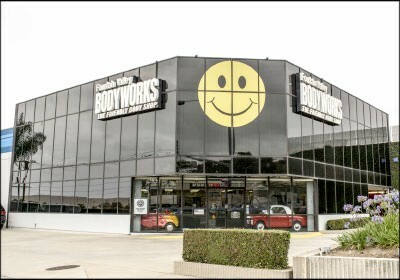 Fountain Valley Bodyworks is the highest rated and biggest auto body shop in Orange County, and home to Big Smiley, our 12-foot smiley face that hangs on the front of our building. With a combined 85,000-square foot facility, our collison center contains five auto body divisions that specialize in every area of the repair process. The size of our facility has also allowed us to retain the largest staff of any body shop. Having the largest, most skilled staff on site increases the speed of your repairs as well as the attention we can give each and every vehicle that comes through the shop. Whether your car needs our Bumper Repair Center, our Minor Repair Center, our Major Repair Center, Collision Center our even our Car and Truck Tow Yard, our facility is prepared to handle any damage or any repair you might need. 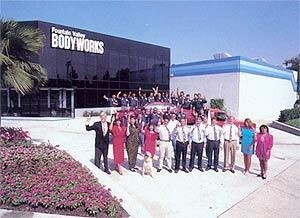 In 1974, Owner Dave March created Fountain Valley Bodyworks to set a new collision center standard in Orange County. He wanted to create a facility that not only invested in the best and most innovative equipment, but also invested in the customer experience. To do this, March has scrutinized every step of the repair process to ensure that every customer leaves our building with a smile. He has built incredible partnerships with part manufacturers, car manufacturers, and insurance companies. He has invested heavily in his staff, from certifications and ongoing training, to hiring the best technicians from all over the world. He has created specialized divisions for any repair your vehicle might need, including a Car and Truck Tow Division just so our customers don't have to pay for storage while their working out their claim. He has also trained his staff to walk and guide every customer through every step of the repair process, from getting you into a rental car, to working with insurance companies, to keeping you updated every step of the way. There is nothing in the collision center shop experience that March hasn't thought of, or invested in. Why use our Collision Center? Although we strive to be the most innovate body shop in Southern California, we also care deeply about being part of our community. Every year we hold food drives, deliver presents to underprivileged kids in Orange County, and sponsor local events and teams. We even let the high school track team come in and get water everyday! We want the community to know that we support them. That's part of the reason we decided to make our logo into a 12-foot smiley face on the front of our building. We want to greet every customer, every resident, and everyone driving by. That's who we are. That's why we've been voted Best Body Shop by the OC Register and OC Weekly eight years and a row. Because we care about our customers. We care about our community. Also offering Costa Mesa collision repair services.